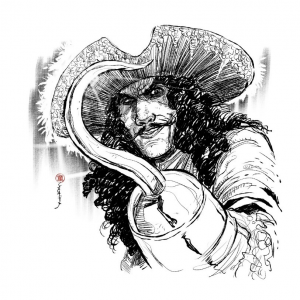 ‘What if Peter Pan grew up?’ That was the question answered by Steven Spielberg’s Hook, a delightfully colourful tale starring the late Robin Williams as the grown up ‘boy who could fly’. Forty-something and fat, Peter has forgotten about his past and has lost not just his own inner child but also his two children, kidnapped by the titular Captain and taken back to Neverland, where a challenge awaits. John Williams had something of a head start on Hook as the project started out years earlier as a musical vehicle for Michael Jackson. Songs were written – with lyricist Leslie Bricusse and they form the basis of some of what remains in the score. The music is pure fantasy as Williams created memorable themes and coloured them with all the magic and sparkle he could muster. Flight to Neverland is itself an awfully big adventure, taken from the film’s End Credits.